On June 14 we honor Old Glory on National Flag Day. 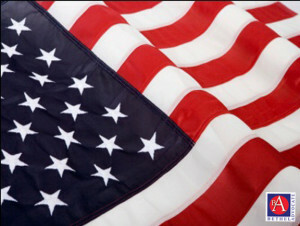 This day commemorates the adoption of the United States flag on June 14, 1777. On National Flag Day, Americans show respect for the U.S. Flag and what it represents. Representing independence and unity, the Stars and Stripes have become a powerful symbol of Americanism and is flown proudly. While Betsy Ross has been given credit for stitching together the first American flag, there isn’t any sound evidence supporting the story. At the same time, there is any to disprove it, either. During Ross’s Revolutionary time, several standards were carried bearing red and white stripes and varying symbols where the blue field and stars now reside. Since 1777, the design of the flag has been officially modified 26 times. For 47 years, the 48-star flag was in effect. In 1959, the 49-star version became official on July 4. President Eisenhower ordered the 50-star flag on August 21, 1959. Seventeen-year-old Robert G. Heft of Ohio designed the 50-star American flag. His was one f the more than 1,500 designs that were submitted to President Dwight D. Eisenhower. Many people have died protecting our country. On National Flag Day, raise the flag and fly it proudly. Use #NationalFlagDay to post on social media.